Wash orange. Remove zest- set aside. (see link- if you use a zester you may skip the next step.) If you use a vegetable peeler to remove zest- place the zest strips into the food processor and pulse until minced. Remove all pith (white membrane) from orange. Coarsely chop. Place zest and orange chunks into food processor. Pulse until coarsely minced. (see pic.) Set orange mixture aside in bowl. Place cranberries in strainer. Wash and remove any cranberries that are soft, wrinkled or otherwise blemished. (see pic) place cranberries in food processor. Pulse until coarsely chopped. 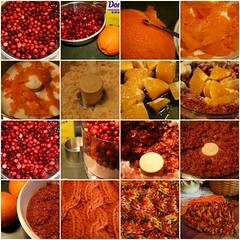 Combine orange and cranberry mixtures. Add 1 1/2 cups sugar. Mix well. Refrigerate- best if used 2-3 days after making. After 24 hours- taste and see if additional sugar is needed. If so- add about 1/2 cup more sugar, mixing to combine. 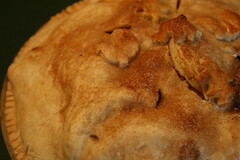 Remove pie crust from box- let sit at room temp until pliable. Peel, core and then thinly slice (about 1/4-1/2 inch thick) the apples. In a bowl, combine with flour, sugar cinnamon and salt. Mix or toss to coat apples. Unroll and press bottom pie crust into pan. top with a pat of butter and a sprinkle of cinnamon. Use a pastry brush to brush pie top with milk. 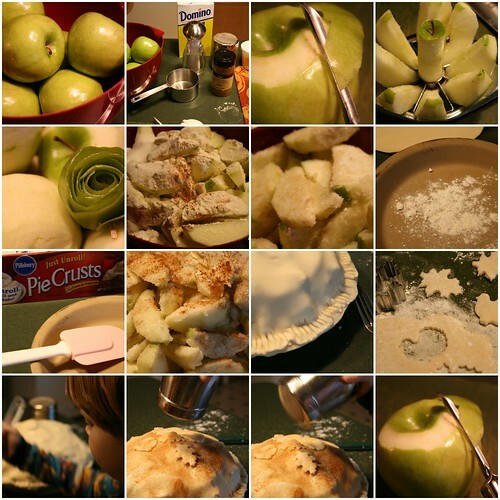 Place “cut outs” onto pie top by brushing bottoms with milk. Sprinkle pie with cinnamon sugar. Use sharp knife to cut “vents” into pie top. 5) Add the orange chunks- pulse till your preferred consistency. Caution- my oldest has been known to eat this by the bowlful. (SO has my step-dad) Also great with pork- and chicken. My FIL requests it…. He’s diabetic- and I’ve subbed in splenda for him- it works- but isn’t quite the same. I will be making 3 huge batches.